Yamini Thankachi - Ganesh Kumar brawl reaches the next stage as star-turned-Kerala minister KB Ganesh Kumar filed a petition for divorce through his lawyers K Ramkumar and Abdul Kharim. On the other side, Yamini Thankachi called a press conference speaking out against her husband. Kerala minister for Forest K B Ganesh Kumar has filed a divorce petition from his wife Yamini Thankachi in the family court in Thiruvanathapuram through his lawyers K Ramkumar and Abdul Kharim. In the petition Ganesh Kumar has accused his wife Yamini Thankachi of torturing him before the domestic helpers at his home on 22nd February and 7th March. Photographs which carried injuries on his face were also submitted along with the petition. Meanwhile the court decided to hear the plea on 29th June. Yamini Thankachi who called a press conference spoke against her husband making allegations that he had been abusing her for the last 16 years. Adding more, Yamini told the press that Chief Minister Oommen Chandy and the Labour Minister Shibu Baby John who had promised to take initiative in solving the problem failed to do it so. It was on 21st February 2013, a prominent newspaper reported that "a minister in the state cabinet was beaten up by the husband of a lady with whom he had an affair". Following the news report, on 3rd March, Chief whip P C George called upon a press conference and revealed that the man in allegation was Mr.Ganesh Kumar. Dr Yamini Thankachi who met chief minister Oommen Chandy had talked with him the extra-marital relationships of her husband. During the press meet, Yamini claimed that Ganesh Kumar had an affair with the mother of her son's classmate. Making the issue alive, opposition leader V S Achuthanandan and other opposition leaders had called upon the resignation of the minister. 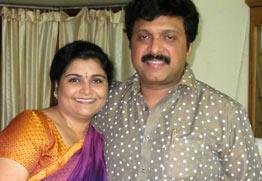 Ganesh Kumar – Dr.Yamini Thankachi couple is having two sons; Adithyakrishnan and Devaraman.